Some of the foods that would most enhance nutrition in diets in the developing world are also the riskiest in terms of food safety. Numerous health risks exist along the value chain for livestock and fish products, from production to consumption. In this post, Sophie Theis (Research Analyst, Poverty, Health, Nutrition Division, International Food Policy Research Institute) and Delia Grace (Program Manager, International Livestock Research Institute) relate findings from a recent A4NH/International Livestock Research Institute analysis of 20 livestock and fish value chains in Africa and Asia that reveal how gender differences in value chain participation influence risk exposure. The results from the participatory risk assessment of these value chains are published in Grace et al 2010, and a paper analyzing the gendered dimensions of risk is underway by Delia Grace, Sophie Theis, Kristina Roesel, Erastus Kang’ethe, and Bassirou Bonfoh. In rural Mali, a Fulani herder finishes milking a cow and hoists the calabash to his head, the milk sloshing gently in the vessel as he carefully carries the milk to Mariam, the woman he works for. By custom, Mariam has never milked a cow, but once the milk is in her domain, she is in charge of its business and use. Today she decides to keep this calabash for the family, since she has been able to sell milk at a favorable price often in the past week. She sets most aside to naturally sour, which will preserve it in the absence of refrigeration; the fermentation gives a sharp taste that consumers find thirst quenching in the hot season. In the outskirts of Nairobi, Faith works the udders of her dairy cow. A male relative she has hired to help with the milking approaches with another pail of milk. She accepts it absentmindedly; she is already estimating the prices she will get selling the milk to neighbors and the local milk bar and considering whether she should invest the revenues in hiring another person. In rural Mali, periurban Kenya, and many other parts of Africa, women play important and varied roles in livestock and fish value chains. 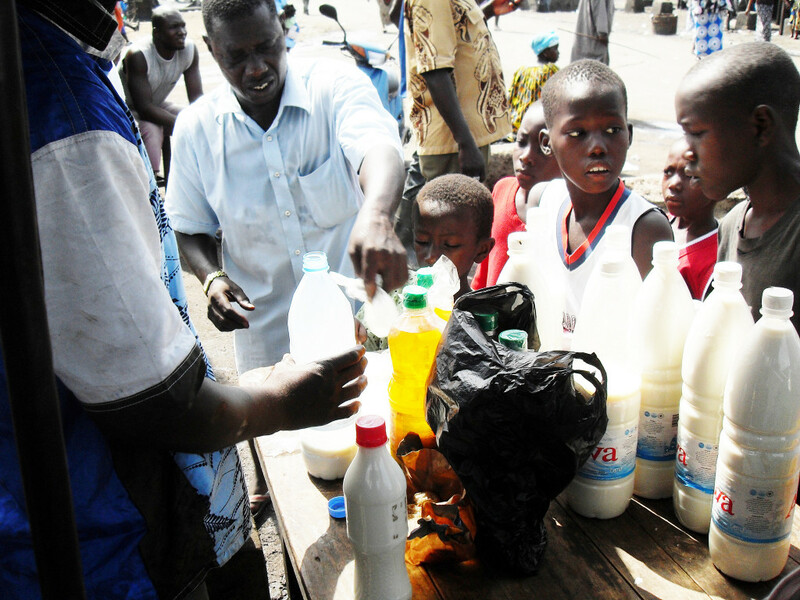 The milk that Mariam and Faith helped to produce goes both to their families and to the market; it is also valued as gifts and in Mali as a sacrifice that brings blessing and protection against evil. 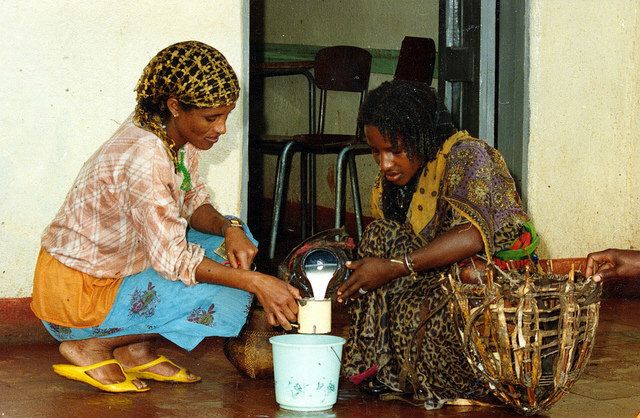 The decisions that Mariam and Faith make have bearings on many people’s nutrition: the quantity of milk that they keep for their household, how they apportion milk amongst household members, the use of the income from milk that they sell, and – less often acknowledged, but critical – the extent to which they effectively manage food safety risk, preventing contamination of the milk. Many of the most nutritious foods, including animal source foods, are amongst the riskiest in terms of pathogen transmission. Meat, milk, fish and eggs provide plenty of nutrients for pathogenic organisms and can also carry infections from animals that harbor them to people. Food-borne disease persists as a major public health problem in Africa and Asia, where the majority of these foods are produced by smallholders, marketed through the informal sector, and sold in wet markets. Food safety in these products is a major concern, as informal markets are important sources of food for the poor and tend to provide food that is more accessible, affordable, and compatible with local preferences for certain varieties of food and quantities than supermarkets. Women like Mariam and Faith manage risk as they interact with informal markets by selling and buying food for their households. Informal value chains are complex, shaped by a number of actors. While risk management training interventions tend to focus on the owners of livestock or on actors only in one node of the value chain (e.g. butchers), risk management relies on all the actors along the value chain, from production, aggregation, processing, retail, and consumption. Many of these actors are women, and attention to local norms in the division of labor is critical for targeting food safety assessments and interventions. Participatory risk assessment is an approach that can shed light on the nuances of food safety. 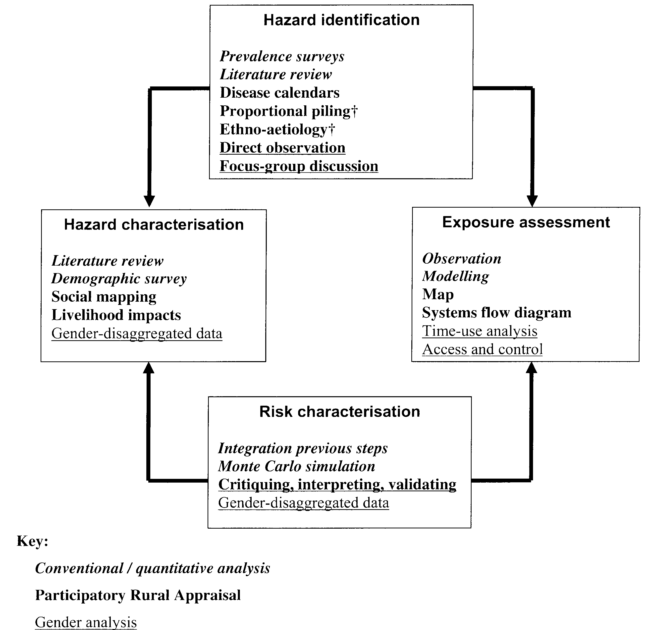 Combining participatory methods and gender analysis with a traditional risk assessment framework, participatory risk assessments use qualitative methods, stakeholder engagement, and biological sampling for food-borne pathogens. How do the activities and resource use patterns of women and men differ according to value chain and according to the stage in the value chain? How do these activities and resource use patterns affect the exposure of women and men to hazards? How does the biology of women and men, young and old, healthy and sick, affect their vulnerability to different diseases? As food systems undergo change and evolution, how might this advantage or disadvantage different women and men? Certain trends appeared: across all value chains, a gendered division of labor is apparent (Table 1). While either men or women tend to predominate at any given stage in a value chain, every value chain involves both men and women in different stages along the chain. 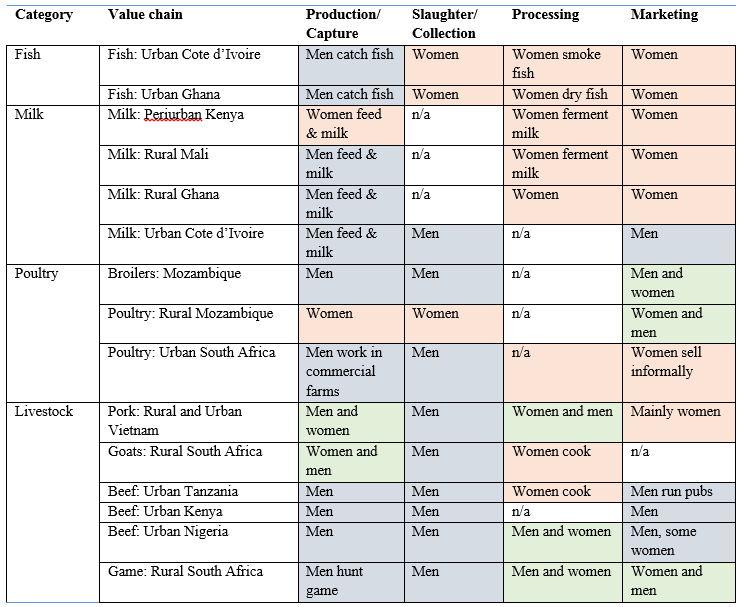 Some stages tend to be managed by one gender across value chains, with men more active in production and slaughter activities and women in processing and retail; however, this varies by location. 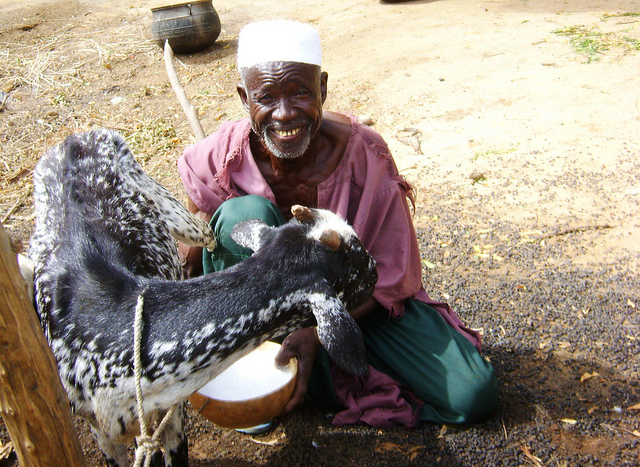 Faith and Mariam are typical in that women are often responsible for processing and marketing milk, while in west Africa, men feed and milk the cows. Female dairy managers like Faith in periurban Kenya feed and milk cows, even hiring men to help them. These socially-constructed gender roles in the value chains were associated with various food safety and occupational hazards. For example, infections from direct contact with cattle were associated with those who milk cows, mostly men in West Africa and women in Kenya. Since men were dominant at the slaughter stage, men were more at risk of brucellosis or anthrax infection from the slaughter of diseased animals or infection if hands are not washed prior to touching mouths or foods. With food consumption, women were more at risk of contamination because they are more likely to consume offal than men. The findings from the analysis of these value chains indicate that differences in risk exposure between men and women derive primarily from gender-based differences in occupational exposure, and secondarily, to differences in patterns and practices of the food consumed. Biological differences between men and women were less important determinants of health risk; but can be important for some value chains and diseases. For example, In Ghana, listeriosis from contaminated, uncooked milk caused a high rate of miscarriages amongst women. Attention to the influence of gender on risk exposure and risk management along the value chain is critical for improving food safety and managing health risks in informal markets. Gender-based differences in activities along the value chain are context-specific and nuanced but have significant bearings on food safety. Participatory risk assessment methods can help elucidate these roles and reveal targeted opportunities for risk management. Even when women are not the primary owners or decision-makers over livestock, women’s knowledge and practices in informal value chains and within the household make them important risk managers. Grace, D., Randolph, T., Olawoye, J., Dipelou, M., and Kang’ethe, E. (2008). Participatory risk assessment: a new approach for safer food in vulnerable African communities. Development in Practice, 18(4-5), 611-618. Grace, D., Makita, K., Kang’ethe, E.K., Bonfoh, B. (2010). Safe Food, Fair Food: Participatory risk analysis for improving the safety of informally produced and marketed food in sub-Saharan Africa. Revue Africaine de Sante et de Productions Animales 8(S): 3-11. Grace, D., Olowoye, J., Dipeolu, M., Odebode, S., and Randolph, T. (2012). The influence of gender and group membership on food safety: The case of meat sellers in Bodija market, Ibadan, Nigeria Tropical Animal Health and Production. 44(1), 53-59. Great post! The evidence presented on the roles men and women have in specific value chains is useful as most of the evidence I have seen falls under horticulture/grain production. Just yesterday I looked at some data about men and women's roles in two value chains and their perceptions didn't align. In most cases, women claimed responsibility in a value chain when she did the work. Men claimed responsibility if they financed or supported the work. I'm curious to know if in the cases examined this problem was also discovered. In most cases, women are accountable for food items safety. However, due to the heady everyday duties they always have to fulfill, it not easy for the to give much or adequate focus on food.